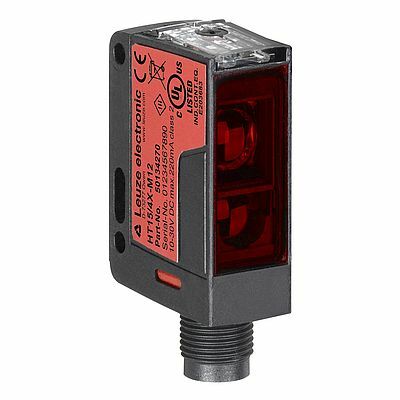 Leuze electronic introduces another member of the Global Beam family with the compact standard sensors of the 15 series in an IP67 housing. The new series is suitable for the reliable detection of objects in industrial environments - particularly when it is a case of dealing with standard automation tasks in the areas of conveyor systems, material flow or secondary packaging in which large operating ranges are required. The SR 15 sensors are available with a cubic design. An extremely bright light spot and an easily accessible potentiometer make installation quick and simple, even in tight installation situations. The 15 series is available with different operating principles and can therefore be used in a flexible way - it is even suitable for special requirements such as detecting glossy objects and reflective surfaces. The high function reserve makes reliable detection possible even in extreme situations, therefore reducing the risk of a system standstill. As far as the users are concerned, the new series represents an economical solution with a good price/performance ratio.